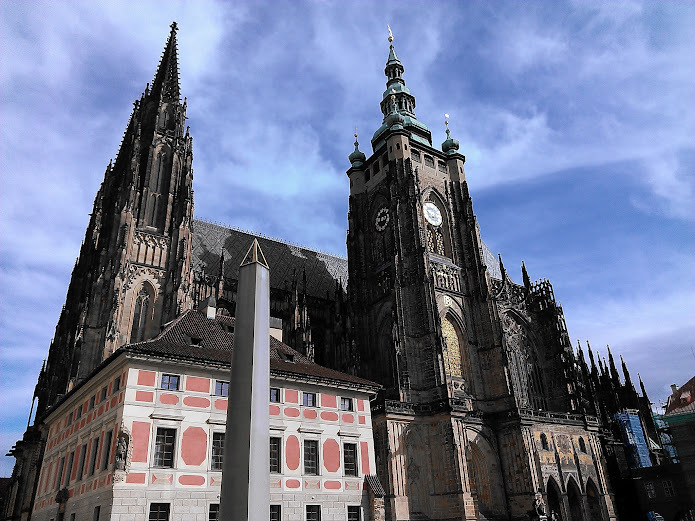 While my other blog posts have been far afield from chemistry, I did actually learn some things about science at the EuCheMS chemistry congress! As a reference for myself and any interested parties, I have listed a few exceptional talks I went to, along with links to representative papers. I also learned of a number of books that I want to investigate. If you have read any of them, let me know what you think! Gerhard Ertl - Nobel Laureate who uses scanning tunneling microscopy to see individual atoms moving on surfaces! See a transcript from a lecture of his here. Han Zuilhof - a researcher from the Netherlands at Wageningen University who uses photochemistry to bind organic monolayers to various substrates. Very beautiful work. I need to read this paper of his. Andreas Stein – a professor from my own institution, the University of Minnesota. He gave an amazing lecture summarizing his work in hierarchical porous structures. See here for a review. Peter Heseman – a researcher from the Institut Charles Gerhardt, Montpellier, France. His gave a very clear and interesting talk about incorporating organic groups into silica precursors for functionalized silicas. One of his papers can be found here. Helmut Schwartz – a distinguished chemist from Technische Universitat Berlin who gave what I think was the best talk of the congress. He spoke on his research in methane chemistry using hand-written slides that probably came from a transparency. I loved his lecture style and really got interested in the chemistry, even though I am not an organic chemist. Here is an author profile on him from Angew. Chem. Selections from the “Living Ethics” books by Nicholas and Helena Roerich. See here for a full list of titles. Overall I am incredibly grateful for the knowledge (scientific and otherwise) I have gained on this trip to EuCheMS. If you are interested in keeping up with me, check out my individual blog! 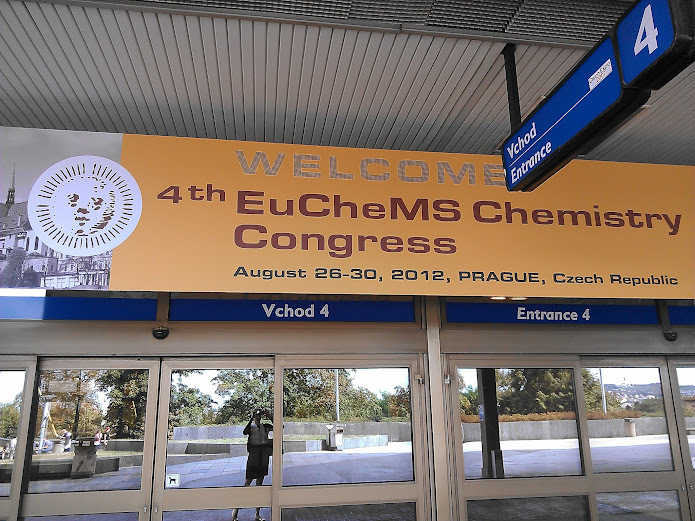 Although I have seen a plethora of scientific results in the last few days, I am choosing to write about the less quantitative results of an international experience such as attending this EuCheMS chemistry congress. Steve Meyers gave a great talk today on ACS’s GREET program, in which he mentioned several benefits of international collaboration. In particular, he showed that students who had been a part of an international collaboration developed more confidence in unfamiliar situations, gained a global perspective, and displayed an increased desire for more international collaborations. These were the results of 6-8 week collaborations with lots of face-time with international colleagues. 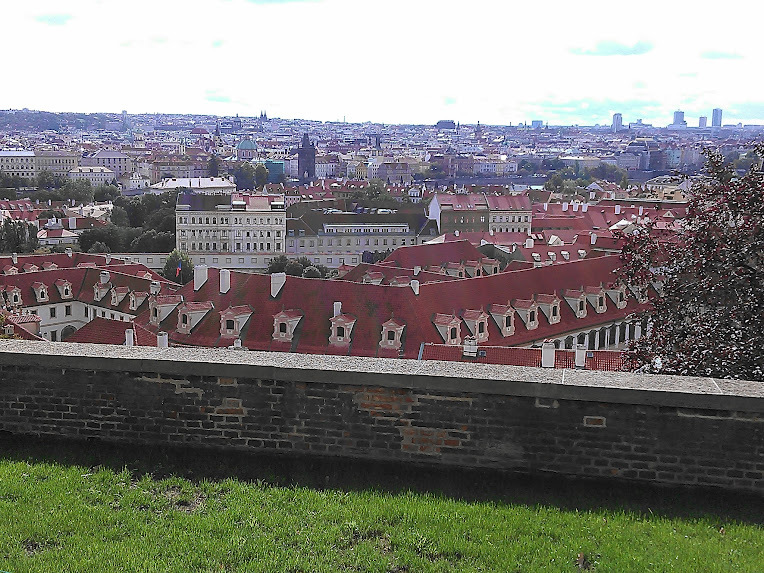 My own observations come from brief visits to other countries, including this 5-day (so far!) 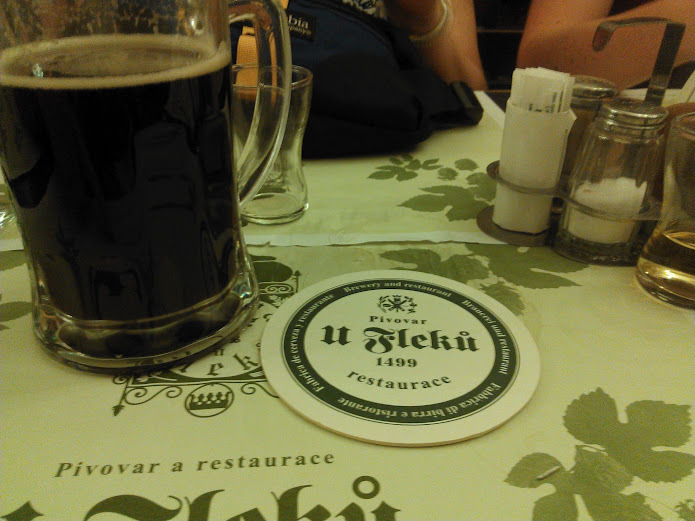 visit to Prague. Being in an unfamiliar situation has a number of advantages. The first and perhaps most obvious is that the traveler is exposed to new ideas and new ways of thinking. 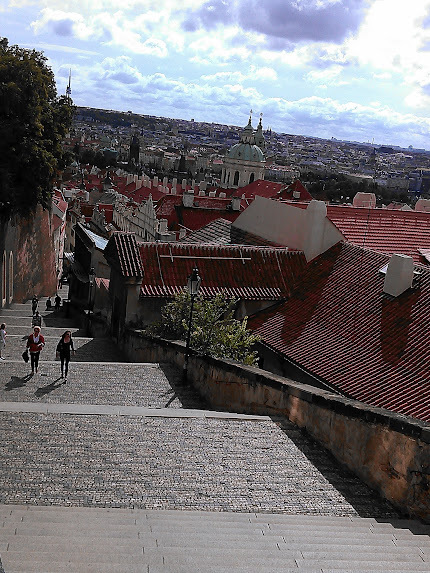 I experienced this by observing the culture of Prague in general but also by listening to the scientific talks. Many presenters offered opinions on chemistry, the role of a chemist, and the state of the world in addition to their specific results (this was particularly prevalent in the “Ethics in Chemistry” section I attended). The next advantage of unfamiliar situations is a fun one – it brings people together. I am fairly introverted by nature and have a hard time meeting new people, but it did not take long to make friends with the other winners of this ACS travel award to EuCheMS. Not knowing the language or the layout of the city gave us a reason to stick together and made socializing (and exploring) easier. The biggest ‘unfamiliar situation’ benefit I have found is an enhanced awareness and attentiveness to almost everything I experience. For instance, not knowing the language encourages me to pay close attention to landmarks, pictures, and repeated words and characters, and listening to talks given by presenters with accents requires me to focus while they speak. This language barrier has another interesting effect: it makes me shut up. Instead of talking about what I think or what I want, I listen and I observe. These quiet activities develop humility and help to combat arrogant or judgmental assumptions I might have made previously. 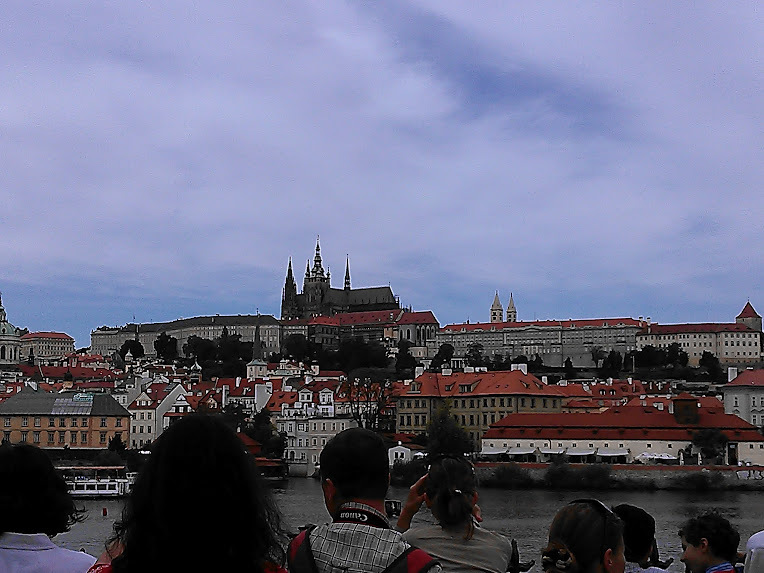 I am fortunate to be able to spend several more days in Prague, and I hope this humility and attentiveness will develop even further. Once I go home, I want to keep this attitude of constant learning. I suspect that my science and my life in general will improve as a result. While listening to Professor Gerhard Ertl’s (2007 Nobel in Chemistry) Plenary lecture on Monday morning I was reminded of one of the most interesting things about chemistry: the fact that processes which occur at the atomic and sub-atomic levels are responsible for nearly everything. Muscle function, photosynthesis, respiration, and more - the list could literally go on forever. This juxtaposition between nanoscale properties and macroscale applications is striking. For instance, Prof. Ertl is perhaps most well-known for his discovery of the mechanism of the Haber-Bosch process, which reacts nitrogen and hydrogen gasses to form ammonia, which allows farmers to increase their yields to meet the needs of a growing planet. Professor Roger Tsien (2008 Nobel in Chemistry) gave another Plenary lecture earlier today on his word in biological imaging. Tsien’s lab uses the relation between nanoscale (in this case even smaller) phenomena for selective chemical imaging of tumor cells. Further development of his lab’s work could lead to surgeons being about to more effectively remove tumor cells, resulting in lower healthcare costs and longer lifespans for patients diagnosed with cancer. These types of nanoscale arrangements are all around us, yet often I lose sight of that fact. I shouldn’t, because the world seems a much more interesting place knowing that there are trillions and trillions of molecular interactions happening at every second. Over the last several days, I have been paying close attention to how chemists at every stage of their career communicate during presentations and poster sessions. A few insights that I have gathered are discussed below. I have to give the caveat that I am a teacher at heart and prefer educational talks. I realize that other people have different presentation styles, and I would appreciate it if anyone wants to leave comments about the benefits of other styles. Saying “Due to time constraints, this must be simplified” or a similar comment often. I attended one talk in which the presenter took about two minutes from the allotted presentation time by making multiple comments similar to this. In addition, I would like to comment that although a chronological presentation of your experimental journey is sometimes useful, it is not guaranteed to be the best way to make your point. I have been fortunate to observe a number of techniques which do work! These can be grouped into two areas: context and engagement. I believe providing context should start even before your research introduction. This applies more to a poster presentation than a talk, but introducing yourself and giving a one-sentence summary of the type of work you do will help to orient unfamiliar audience members before you launch into the science. During the presentation, provide some background for the work, keeping in mind that acronyms, molecules, processes, and techniques that are very familiar to you might not be familiar to your audience. Be careful, however, to only include the pieces of context that are important for the talk. It might be true that there are another three processes that lead to this one, but if they are not relevant to the data you present, it will only serve to distract your audience. The last category I would like to discuss is engagement. Thus far I have seen some great examples of this. Those presenters who engaged their audience the most displayed a good balance between looking and talking at the audience and looking at the screen. When presenting data, it isn’t realistic to say ‘never look at the screen,’ but that does not give one license to never look at the audience! I have seen a few people balance this incredibly well. I have also noticed that I am more engaged as an audience member when the presenter moves (a little! ), gestures when appropriate, and varies their voice inflection as they tell their research story. As I have reflected on this engagement piece, it occurs to me that there are many who might not agree with me. My advice here is given as though the primary responsibility for engaging the audience lies with the researcher. Some might contend that a presenter is not an entertainer and that it is up to the audience to keep up with the presentation. I would appreciate hearing others’ thoughts on this balance in the comments below. Day one of talks at the 4th EuCheMS Congress in Prague is in the books, and I thought I would share a few pieces of advice for presenters. I think that in the vast majority of cases, the presentation is often perceived as being poor because of a few easily correctible mistakes: the presenter is nervous; they try to squeeze to much information into the allotted time; and they assume that everyone in the audience is an expert in the field. I think every presenter can benefit from the following three tips. Relax. This applies mostly to graduate students without very much experience talking at conferences, but not exclusively. I understand that it takes a lot of nerve to get up in front of an audience of experts in your field (I did this myself yesterday), but if you are so wrought with nerves that you can’t complete a sentence, the audience will not be able to follow your ideas. The bottom line is that no one in the room knows more about the specific experiments you’re talking about than you. Others may know more about a small portion of your work or a particular technique you discuss, but no one else has slaved for months or years carefully collecting the data you are presenting. In addition, you’ve put it the effort in arranging all of that data to tell a good story – don’t let nerves get in the way of you physically being able to tell it. Which brings me to my third point: don’t assume everyone in the audience is an expert in the field. One minute of introduction at the beginning helps clarify everything. It sets up the big picture and stops the audience from asking, “why do we care” at every slide. If you’re feeling generous, you can even remind the audience why your data is important several times along the way. Your work is important, help everyone else understand why. I think if more talks followed these simple suggestions, I would enjoy every one. ACS calls us to do good in its vision: “Improving people’s lives through the transforming power of chemistry.” Madeleine Jacobs spoke about it at breakfast this morning, saying that none of the world’s pressing problems (energy, food, disease, etc.) would be solved without the involvement of chemistry. ACS publishing contacts like Peter Stang and Sonja Krane demonstrated it during the question and answer section of the JACS publishing seminar. They addressed audience concerns thoughtfully and explained the reasoning behind publication access choices (electronic and print). I am glad that my assumptions were wrong. Chemists may study their science for the pure joy of discovery and the wonder of matter (I do! ), but we also study for the benefit of the world. Out of context, such a statement might sound corny to the point of being insincere, but I know this is not the case. Each event I have attended today and reflection on my past experiences shows that chemists really want to do good. Even better, we have the skills and tools to do so. Having never traveled outside of the US there have been many new experiences in just one day. Being in the generation where we are addicted to our cell phones/computers it is strange being in a place where the Internet is not at my finger tips. It isn't too hard to disconnect and concentrate on the amazing science going on in Europe and this once in a lifetime trip the ACS has so generously organized for us. Except you don't realize how easy it is to find your away around when your iPhone shows you a little blue dot and a blue road to follow! So the lesson we learned today is don't forget your basic map skills! Trying to remember if you are heading North or towards the river or which way you were headed on the metro takes some energy and makes you think! Which I suppose is an important lesson to learn. That while technology has taken us as a society to places we never thought were possible, there is nothing that can replace the human mind and it's ability to think, be creative, and problem solve. I anticipate that those characteristics will be echoed all throughout the EuCheMS Congress. With Nobel Prize winners, fantastic universities represented by both students and faculty, and industrial representatives all in one place collaborations will be formed, friendships forged, and ideas exchanged. As I prepared my poster presentation for the 4th EuCheMS Chemistry Congress in Prague, Czech Republic, I was struck by the large size of my “acknowledgements” section. It contains references to collaborators and instrumental experts without whom I would have had a very difficult time collecting and analyzing my data. It also mentions infrastructure which supports my work – grants, characterization facilities, and chemical societies. 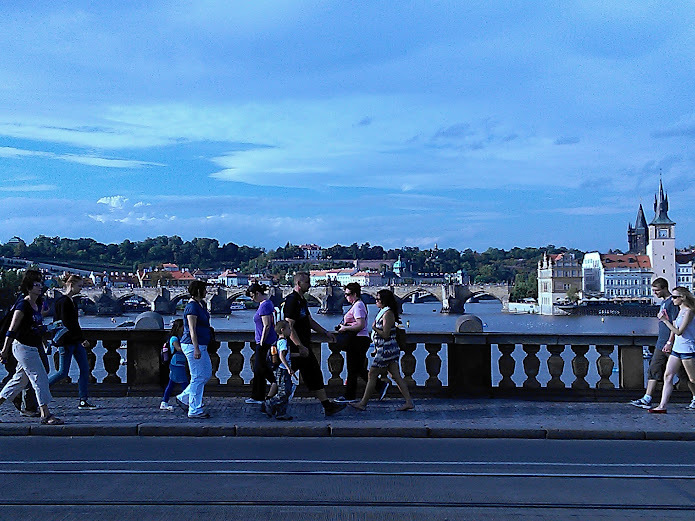 I spent a fair amount of the plane ride to Prague reflecting on the fact that my research was made possible by the interconnectedness of the field of chemistry. Later, at the opening ceremony and first plenary talk of the congress, I was reminded again of the network which exists within chemistry. Several distinguished chemists were given awards for a lifetime of achievements. As these achievements were listed, I thought of all the chemical principles which were discovered or refined by these people, and how much I owed to them – despite not having heard some of their names previously. I suddenly became aware of the relative smallness of my knowledge of the history of chemistry. Truly, I stand on the shoulders of giants, even if I don’t realize it all the time. After the opening ceremony, I was fortunate to spend some time with Madeleine Jacobs, the Executive Director of the American Chemical Society, and some of her colleagues whose work relates to the publication of chemistry journals. As we talked about alternative careers for chemists, she said that she greatly values those who work in chemistry publishing and journalism. She contended that those employees were chemists, just not at the bench. “They still support the mission of ACS, to improve the quality of human life through the transforming power of chemistry.” I thought about how my research and my career as a chemist are supported by infrastructure and societies such as ACS. During my undergraduate career, I sometimes felt like I was learning chemistry in a vacuum. I was just one person among thousands, maybe even millions of chemists around the globe learning a very well-established, immobile field. As I grow, however, I am learning about the active and evolving nature of chemistry – how I as a student can impact the science with my research, and how that impact could not be made without the extensive network that I am now a part of. I gratefully acknowledge that my discoveries and successes are only possible because of the people around me: the founders and teachers who came before me, the collaborators who move alongside me, and the societies and infrastructure which support us all.